Recently, there’s been a lot of talk about a certain web hosting company in various forums. I’m talking about DotEasy. As I made my research, I noticed that this web host has received mixed reviews from clients. Some are pleased with the affordability and reliability of their web hosting services, while some are expressing their disappointment and recommending others to just look for a different web host. So what’s the real deal? I’ve browsed a vast number of verified reviews and testimonials from DotEasy’s clients to learn more about their experience and what they really think about this web hosting provider. Based on my hosting experience as well as the voice of real customers, I’ve come up with this in-depth review that covers everything you need to know about DotEasy, from their hosting plans and pricing, to uptime record and customer support. Make sure to read up before clicking that “Sign Up” button! Established in the year 2000, DotEasy has been in the competitive world of web hosting for over a decade. Their goal is to offer quality and affordable web hosting solutions. The company claims to have at least 500,000 clients from all over the world. And in order to provide top performance, they use the latest server technology, with a data center headquartered in Vancouver, Canada. Over the years, DotEasy has expanded their services to include web design, SSD hosting, cloud hosting, domain registration, applications, and value-added extras that provide advanced web solutions for more control and flexibility. DotEasy was welcomed by hundreds of thousands of webmasters, but do they still live up to their claims or are they already suffering from the crisis of confidence? Let’s find out as we dig into their features and services. DotEasy offer plans that come with all the essentials to build your website and establish a strong online presence. They also claim to have an expert customer support team that’s available to guide you every step of the way. Their shared hosting services are offered in three different tiers: Starter, Unlimited, and Unlimited SSD. The main differences with these plans are storage space, bandwidth allowance, and number of domain names in a single hosting account. Each of these plans comes with shared SSL for data encryption which ensures the security of your website(s). What’s more, all three plans come with the easy-to-use and every-popular cPanel control panel. Not all web hosting providers let you have access to this control panel on their shared hosting plans, so this is a big plus for me. For as low as $2.98 per month, you can get the Starter plan. It’s a reliable and flexible hosting package that’s best suited for individuals and small businesses who want more at a cheap price. It comes packed with 1 FREE domain name, 1 GB worth of disk space, 10 GB monthly data transfer, 10 email accounts, and 1 domain hosting support. But you better hurry now because the $2.98/month introductory offer will end soon and will revert back to the regular price of $4.75 a month! Starting at just $3.98 per month, you can get the Unlimited plan, which is a one-stop solution for personal and business sites. It builds upon the Starter plan, except that it offers unlimited disk space and bandwidth, as well as unlimited email accounts and domain hosting support. This offers the best value if you need unlimited features, and is one of the most affordable offers for shared hosting I’ve seen so far. What’s more, it comes with a WordPress auto-installer so you can easily build a website that’s powered by this ever-popular content management system (CMS). Finally, there’s the Unlimited SSD hosting plan, which is currently on sale for only $4.95 per month, for the first term. It’s ideal for those who want to achieve more with their website, particularly if you’re planning to launch a full-blown business site or a high-performance personal website. I’d like to emphasize more about this plan because it really comes with some nifty features. For instance, this plan features 100 GB worth of Solid State Drives (SSD) space at NO EXTRA COST. This gives you much quicker data access times and increased site and database access performance so your site is more responsive. What’s more, you can easily run various scripts! With DotEasy’s new SSD storage configuration, your site will be a whole lot faster than any other traditional setup. It’s also optimized for database-driven sites like eCommerce and WordPress-based sites. So if you have an online store and/or you’re using WordPress, this is the hosting plan for you. cPanel is currently the best and most popular control panel for web hosting. Its user-friendly interface simplifies the process of creating and managing a website. DotEasy includes cPanel in all their hosting packages which means managing your domains, email accounts, and databases is fast and easy. DotEasy also provides an easy-to-use, drag-and-drop website builder, as well as tools so you can design and build your own website even if you have no prior knowledge and experience in website programming. Through DotEasy’s partnership with Website.com, they are able to provide their clients with tools to build professional-looking sites, complete with the latest design trends and cutting-edge features. No coding experience necessary! DotEasy has a whole plethora of useful web apps and social media tools that will further expand your site’s functionality. Each hosting plan comes packed with apps like photo galleries, contact forms, blogs, forums, and more – all for FREE! And with the Softaculous automatic script installer, you can install these apps and scripts with just a few simple clicks. 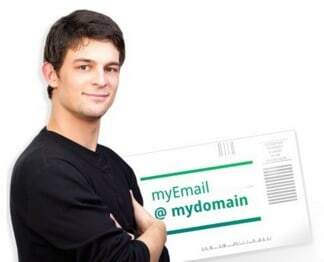 DotEasy provides you with a personalized email address that’s more unique and gives you a professional image. You can access your email boxes online or via the email software provided in every hosting plan. DotEasy offers plenty of features at affordable rates, especially the Unlimited plan. But unlike other web hosting providers, they don’t offer any free advertising and marketing credits (which is already an industry standard). BlueHost, for example, have shared hosting plans at nearly the same price tag as DotEasy’s offers – if not cheaper. They also offer ad and marketing credits on all their hosting plans, and they even include unlimited features in their most basic shared hosting package. Unfortunately, DotEasy doesn’t have Virtual Private Server (VPS) and dedicated web hosting plans. These two hosting options are geared toward those who are in need of a more robust hosting package for running larger websites that require the highest level of security and performance. If you’re in need of VPS or dedicate hosting, consider other great alternatives such as BlueHost, iPage, and eHost. Running a website is no easy task, especially when you’re expecting high traffic volumes. If your site is your chief source of income, then it’s all the more important to keep it up and running at optimum performance all the time. Good thing DotEasy offers Managed Hosting. Managed Hosting is the ideal solutions for those who need a little bit of helping hand in maintaining their website(s) so they can focus on the most important thing: Running their business. By choosing this hosting plan, DotEasy will handle the security, administration, and maintenance of your site. They have a dedicated support team that will handle the work for you, from updating your site’s content, to adding web applications to expand your site’s functionality. Managed Hosting is one of DotEasy’s newest add-on services. The price starts at $29.95 per month, in addition to the cost of your chosen hosting plan. To be honest, this hosting service can be quite costly, especially if you exceed the one hour of administration time on any month. In this case, you will have to pay an additional admin service hour for a regular price of $75 per hour. I know managing a website can be quite costly, but a $75/hour rate is a bit too much, don’t you think? But if you’re really pressed for time and are in need of professional service, then this might just help you out. In fact, DotEasy is currently offering a discounted rate of $50 per hour for the additional admin service hour, saving you $20 if you purchase it today. A huge fan of WordPress? DotEasy offers a number of ways for you to easily launch a WordPress-based website! As mentioned earlier, their Unlimited hosting plan comes packed with a WordPress auto-installer to help you quickly and easily launch a WordPress site within their hosting environment. The Unlimited hosting plan already comes with a protective and up-to-date PHP and MySQL environment for protecting your WordPress site against the harmful insects of the Internet. And to make the entire process of building a WordPress website a lot easier, DotEasy have a dedicated WordPress section on their site where you can find useful resources like a beginner’s guide, knowledgebase, resources, and some very helpful video tutorials. These guides can help you from registering a WordPress account, all the way to finishing the WordPress installation. It’s a convenient and enjoyable way of bringing your WordPress-based site to life. 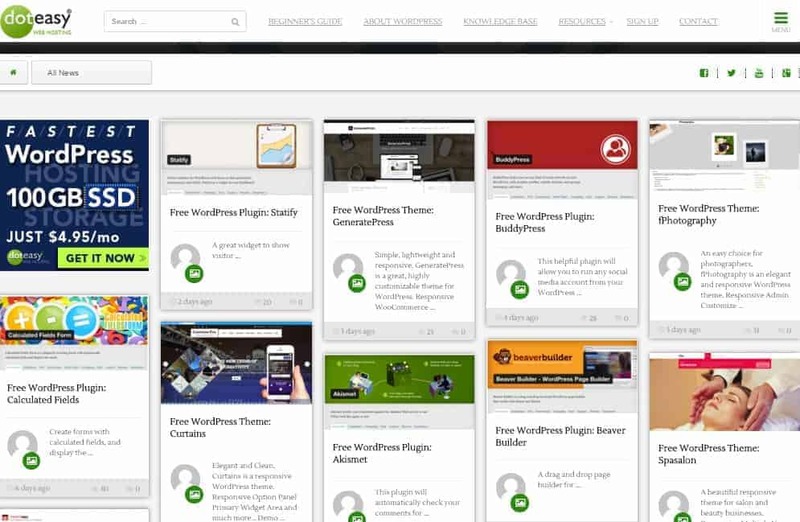 I particularly liked the video tutorials because DotEasy chose the most commonly discussed topics among WordPress beginners, and targeted them in their videos. With the Website.com drag-and-drop website builder, you don’t even have to be a coding wizard to be able to build a full-blown, professional-looking website. Using this tool, you can get your site up and running in just minutes! The website builder is available for free on all of DotEasy’s hosting plans, although it’s available in three different tiers, namely Starter, Professional, and Ultimate. You can see it in action right here. With the Starter website builder, you’ll have the basic tools to build a simple website. The Starter site builder is available on Doteasy’s Starter hosting plan. This site builder is a significant upgrade over the Starter builder as it allows you to do much more. Not only will you get more useful tools, it also allows you to build up to 100 pages, and provides eCommerce features that are not readily available on the Starter site builder. It’s available on DotEasy’s Ultra Hosting and Ultra Windows hosting plans. cPanel Control Panel – Try Out the Demo! An all-inclusive control panel is an invaluable tool for almost all web hosting plans. For this reason, DotEasy has chosen the industry-leading control panel, cPanel, to be used in their hosting plans. It’s available for those who own a Linux-based hosting account. For those who opt for DotEasy’s Basic or Windows hosting plan, they’ll have access to the Ensim control panel instead. For this review, however, we’re going to focus on cPanel. cPanel has become extremely popular among web hosts, and for a good reason. It has the most user-friendly interface and it’s highly customizable, too. DotEasy even has a cPanel demo page so you can get a sense of how easy to use this control panel is. 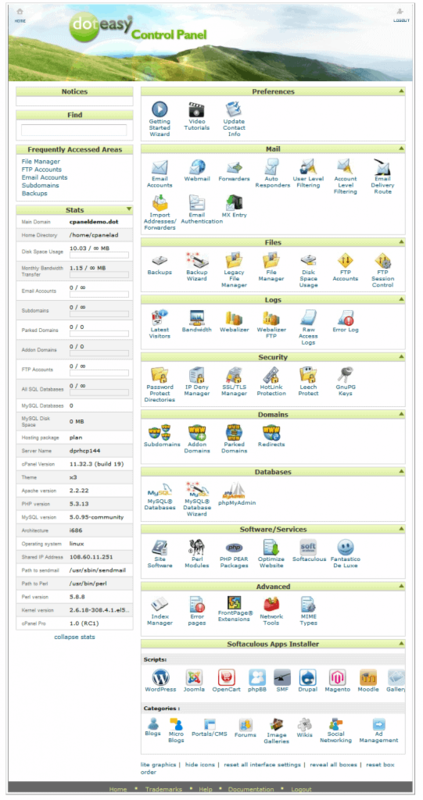 As you can see, cPanel has an icon-driven interface which makes it even more navigable. Since it’s customizable, you can relocate or even hide certain fields according to your personal preference. DotEasy’s cPanel is pretty much the same as used by many other web hosts. You can use it for various tasks such as setting up email accounts, creating users and databases, checking your resource usage, etc. Of special interest is the Softaculous web tool, which you can access via cPanel. 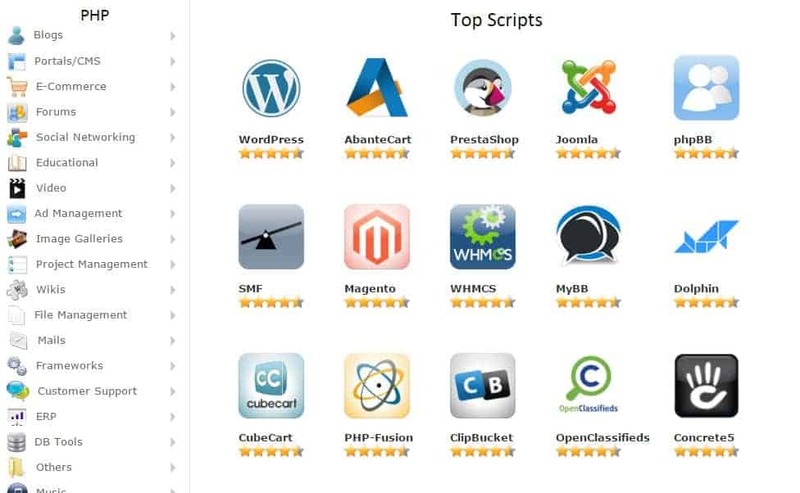 Again, it’s an auto script installer that allows you to install over 250 different scripts and apps with just a few clicks. So if you like a particular script or app, you can simply click the “Install” button and the installation process will proceed automatically, much like an app installation on your mobile device! Try out Softaculous for yourself through this demo page. If you’re currently subscribed to DotEasy’s Basic or Windows hosting plan and are using the Ensim control panel, you might want to consider upgrading to a higher plan to enjoy the benefits of using cPanel. DotEasy claims to have 99.98% uptime to ensure that your website is always accessible to your customers and site visitors. They are currently operating from a Cisco-powered data center based in Vancouver, Canada. Their facility and network is designed and optimized to enhance and maintain the high demands of their clients’ mission-critical sites. They do so by using multiple network providers to ensure data travels in the fastest, most efficient way possible. They also have an in-house support team and technicians who monitor their facilities 24/7. Based on various customer feedbacks, however, the average uptime record is 99.94% (much lower than what they’ve promised) and an average server response time of 658ms. Still not sure if DotEasy is the right web host for you? No worries! You can try it our risk-free for 30 days! And if you’re not satisfied with their service, you can just let them know within the first 30 days of signup and DotEasy will refund your hosting fees – no questions asked. DotEasy offers an industry-standard 30-day money-back guarantee but it doesn’t mean you can no longer cancel your account after the trial period. You can still cancel and get your money back within the first 45 days of hosting service renewal and 14 days of a plan change. However, you’ll have to pay the $15 refund processing fee. This doesn’t include domain purchases, as they are non-refundable. Also, take note that refunds are not available for services that are billed monthly, as well as for one-time service fees like web design fees, file recovery fees, etc. DotEasy provides various avenues for clients who are in need of customer support, especially when they’re dealing with technical issues. If you come across problems, you can reach DotEasy customer support team from 6AM to 6PM PT, Monday to Friday via live chat, email, or telephone. They also have a ticket system where you can submit a support ticket to get help from their support team. I personally prefer live chat but DotEasy’s live chat support is limited to their office hours, as with their phone support. In terms of their support staff, I’ve found that DotEasy have hired the right people for the job, as they’re quite proficient and knowledgeable. I tried out their phone support on a Friday night and asked about WordPress hosting, and the rep who responded to my call was able to answer my questions instantly and efficiently. Besides the usual support methods, DotEasy also has an extensive knowledgebase where you can find thousands of helpful articles, tutorials, and guides, from which you’ll be able to find answers to commonly asked questions. There are many high points to this web hosting provider but as I delved deeper into their services and various customer reviews, I’ve found that there are just as many drawbacks. It’s time to weigh in on the pros and cons so you can make a better decision on whether or not DotEasy is the right choice for you and your website. DotEasy is one of the better known web hosts that’s commended for providing affordable hosting packages, but they’re only limited to shared web hosting. Compared to other web hosts, they also have a very restricted feature set. If you upgrade your hosting plan, you will get a whole range of features, though they’re what you’ll typically expect from any other shared hosting plan. What’s worse, you might have to pay for extra fees for certain service upgrades. But somehow, their weaknesses are cushioned by the provision of an easy-to-use drag-and-drop website builder, as well as their knowledgeable and friendly support staff. DotEasy may be a disappointment to those who are looking for a more powerful web hosting package, but it’s a web hosting provider with a good deal of potential. The potential can be reached, perhaps, if you’re willing to invest far more cash. Select the most basic hosting plan and you’ll be left with very limited features. This may be the most crippling weakness you’ll have to deal with if you go for DotEasy. Overall, I’d say that you can get away with DotEasy if you’re looking to host a website that doesn’t need a lot of complex features and if you’re not expecting high traffic volumes. It’s ideal for individuals who want to build a personal website or a simple small business site. If you’re looking for something beyond what DotEasy can offer, I highly recommend you check out other web hosts. Consider alternatives like BlueHost, eHost, and iPage. I’ve made in-depth reviews about these web hosting providers, as well as other notable web hosts so don’t forget to check them out, too! Doteasy has kept their reputation up in the list since 2000 and they still are. Same here as the above customer….If I could file a formal complaint to the Canada Gov’t I would. Doteasy never communicates I have wasted money and my time Today I am sending a Registered Letter I can get letters and calls from Prime Ministers of countries and I cant get the Founder of Dot Easy to contact me..Is he/she that business and more important than a leader of a country. Upset yes for I am not a Geek.. and still do business the old fashion way and do quite well.. Governors wives have my work and YES!!! Prime Ministers. Still cant get dooooot not easy to contact me. I have paid $57.00 annual ( $114.00 total )each for two web names and get only One Page cover and charged $50.00 for annual domain renewal for two names. I have found out I have been somewhat CHEATED. If anyone wants to contact me..you can GOOGLE…”john durham in arkansas ” You can find me easy I don’t hide and I will call you back. Even China TV interviewed me.. I wonder how much did doteasy paid this writer for this relatively positive review. Look around the internet, you’ll see the real picture is not nearly as rosy. I registered two domains, when it’s time to renew, they don’t provide auth code and told me to submit an application in writing and $15 to transfer each the domain. When a company tries to put down all the road blocks to prevent customers from leaving rather than providing good price and competitive service to keep their customers, you know something is wrong. I’ll run from this company and make sure to never have anything to do with them. Note: I maintain affiliate relationships with most of the web hosting companies I review. I do invest my own money in testing their hosting plans unless it's very expensive such as a $200/mo dedicated server. My goal with this site is to give you the facts you need to choose a host you'll be happy with. Thanks for your support!